Coal tar - You do not need a prescription for this agent and you can apply gels and ointments containing coal tar directly to the skin, to bath water or use it as shampoo. It can stain clothing or your skin, has a strong odor and occasionally it will irritate the skin if too strong. Lubricants - Thick and greasy concoctions seal in water of the skin and reduce the itching and scaling. Bath solutions - Soaking in water with Epsom or Dead Sea salts or boiled oatmeal help to remove the scales of psoriasis and reduce itching. Salicylic acid - This peeling agent reduces scaling and is available as ointments, gels, shampoos and gels. 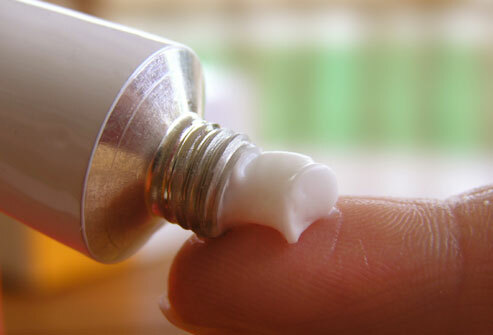 Topical corticosteroids - Often used for active outbreaks of psoriasis, these drugs suppress the immune system, reduce inflammation and decrease the generation of skin cells. Side effects include thinning of the skin and eventually the treatments are less effective. Retinoids - The synthetic vitamin A relieves the itching and scaling, but it can cause birth defects so women planning a family cannot use this form of treatment. Anthralin - Available in ointment, cream or paste, anthralin reduces skin cells and inflammation. You apply it on the psoriasis lesions but you need to wash it off to prevent irritation, and it does discolor most anything with which it comes into contact. Vitamin D analogs - The synthetic vitamin D affects the turnover of skin cells but excessive use can increase calcium to unhealthy levels. Sunlight - The ultraviolet light of sunlight kills the T cells that activate the rapid production of skin cells to produce the scaling and inflammation. Psoralen and ultraviolet A phototherapy - The medicine psoralen makes the skin more sensitive to light and the ultraviolet A penetrates the skin more deeply. This treatment is very effective but long-term treatment may increase the risk of melanoma skin and squamous-cell cancers. Ultraviolet B phototherapy - Broadband and narrowband treatment is an artificial source of light that can relieve the symptoms of psoriasis when topical treatments are not helpful. Retinoids - Not only a topical ointment, retinoids are available in pill form but high cholesterol and liver damage are two side effects of the pill form. Biological response modifiers - Living cells make these proteins, which you or your health care provider injects into your body. The drugs suppress the immune system to alleviate psoriasis symptoms, but they may be connected to certain blood diseases and cancer and users are at a greater risk for infection. Methotrexate - Available in pill or injectable form, this slows cell turnover but it can cause liver damage, and decrease red blood cells, white blood cells and the blood platelets that clot the blood. Cyclosporine - Taken by mouth, this acts quickly but you have to keep taking it in order to get continued relief from the symptoms. You must monitor your usage as it can cause high blood pressure and impair kidney function. Taking care of your mental health is very important and sometimes overlooked, if you are plagued with psoriasis and its outbreaks. Depression, social isolation and anxiety can affect your daily living, and seeking counseling or joining a support group of fellow psoriasis sufferers can keep you in a good mental state. Any of the prescription treatments for psoriasis require monitoring for side effects but if you attend to the symptoms early it is possible sometimes to keep the treatment simple. You have various options but it most important to discuss the treatment with your health care provider and decide on the best management of this perplexing ailment.